Welcome to this well appointed home located in the very desirable neighborhood of Fall Creek. 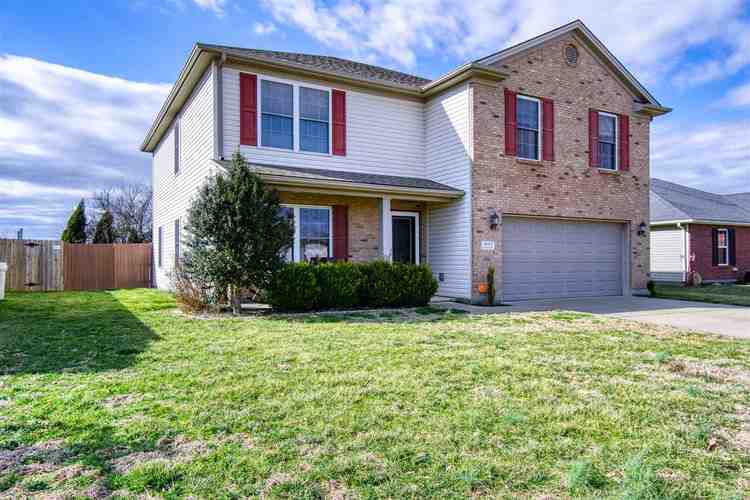 Located in Warrick county yet steps away from all the conveniences of the east side of Evansville. This one owner two story home was custom built with amenities you wouldn’t expect in this price range. Hardwood floors throughout the first and second floor. As you enter you will love the size of the living room with 2 closets and plenty of windows. The dining room is nice in size to accommodate a large table. The kitchen has stainless steel DOUBLE OVENS, built in microwave, GAS RANGE, dishwasher and French door refrigerator. Granite counter tops, large island and TWO pantries. A cozy family room with gas fireplace and sliding door leads to the backyard. A half bath completes the first floor. The second floor has a huge master bedroom, a large walk in closet and a master bath with a separate shower and soaking tub. Additionally there are 3 bedrooms all with walk in closets, full bath, laundry room and a bonus area at the top of the stairs perfect for a study area, TV room, craft room or play room. The large fenced yard offers a concrete patio and an above ground pool. Directions:From Epworth Road Right on Tecumseh, right on Penrose.